This is a sample of the payload your application would receive when using the IBM Watson Speech to Text add-on. Here’s an example that uses the IBM Watson Speech to Text Add-on. The generated transcription will be pushed to the application through a callback from Twilio. The IBM Watson Speech add-on can convert Twilio audio recordings into text using machine intelligence to combine information about grammar and language structure. This is the sample analysis that the Add-on partner provides which is included in the URL of the payload above. See the Add-ons Catalog for the complete list of available add-ons. The first stop in using an add-on is your Twilio Console. Log in and navigate to the Add-ons page within the Marketplace section. Then choose on the add-on you want to enable and click the “Install” button. After accepting the Terms of Service, it will be installed on your account. In this example, we’ll use the IBM Watson Speech to Text Add-on. This application gets the transcription for the recorded call from IBM Watson Speech to Text Add-on we configured in the Twilio console. You can find a detailed specification of the data structure for an individual add-on within that add-on's page in the catalog. 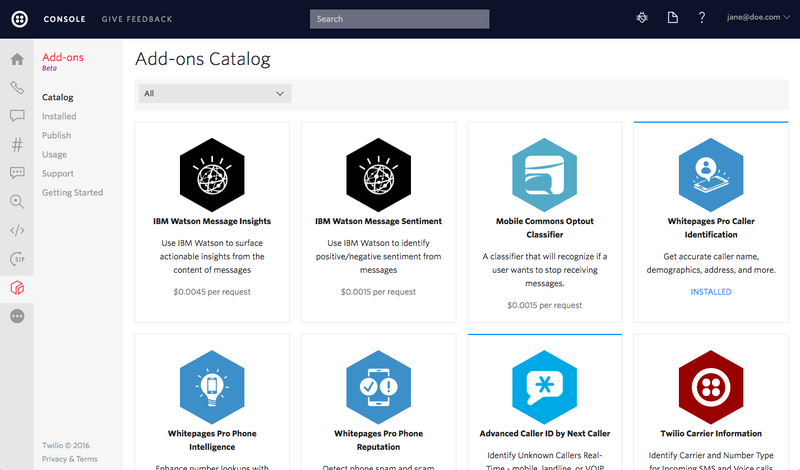 We focused on the IBM Watson Speech to Text Add-on in this guide, but you can just as easily use any of the add-ons available in the catalog in your Twilio Console. Check out the full Add-Ons API Reference documentation if you want to learn more about how add-ons work, or even how to publish your own.